Parenting isn’t easy and it is a full-time job. Most of the parents spend their time looking after their kids and in the process, completely give up on fitness. But this doesn’t have to be the case all the time. In fact, you can even do your workout with your kids, this will keep you fit, help you spend more time with your child and strengthen the bond. Here are 5 exercises you can do with your kid the comfort of your homes. Moreover, these exercises are hard enough to keep you in good shape and easy enough for your kids to participate and keep up. This exercise is perfect to do with your little one. 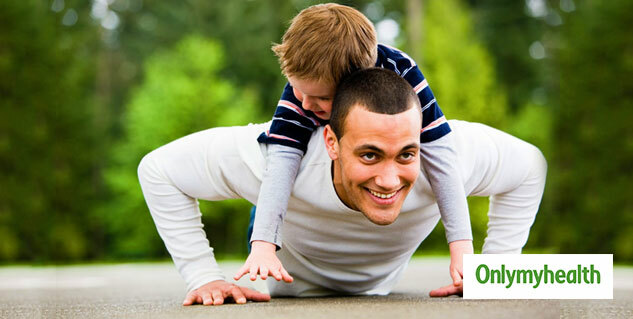 Get your kid on your back when doing the exercise and your child will definitely have fun doing it. Start with placing your hands under your shoulder. Extend your legs and ask your child to climb on your back. Keep your core tight and back straight. Lower your body until your chest nearly touches the floor, now push yourself back up. Do 10 reps.
Planks are great for your core, it builds strength to sculpt your waistline and improve your posture. Put your elbows on the floor and raise on the tips of your toes, keeping your back and abs straight in a line. Hold that position for 30 seconds and repeat. Do 15 reps in 3 sets. Your kid won’t be able to hold on for that long so make sure they don’t overdo it. Burpees are an equipment-free exercise that works for your entire body and is also good for your heart. Begin in a standing position, keeping your shoulder-width apart. Lower your body into a squatting position and place your hands on the floor. Kick your feet back so that you are in a push-up position. After this, do a push-up. Kick your feet back to the original position and repeat. Lunges help your bums and legs tone up and doing it with your kid will only maximize its effects. Start with keeping your body straight. Keep your core engaged and step forward with one leg, lowering your hips and until knees are bent at about a 90-degree angle. Your front knee should be above your ankle and other knee should not touch the floor. The weight should be in the heels as you go back to the initial position. Squats help your tone your lower body and incorporating your kid in the exercise will give the exercise a whole new dimension. Stand with your shoulder-width apart and toes pointed outward. Lower your hips and sit like you would on a chair. Let your child climb on your back and hold on to them tightly so they are safe. Contract your abs and put the weight on your heels. Come back up, lifting your hips up and forward. Considering the amount of movement these exercises include, your kid might get tired so let them do as much as they can – the whole point of this is that you exercise and they have fun.